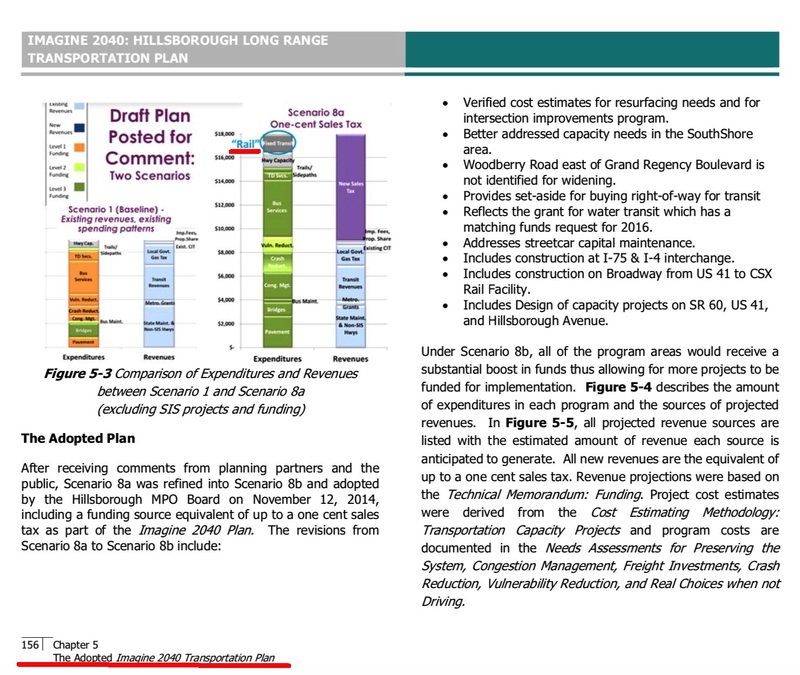 There is no transportation plan and not one project referenced in the ballot summary language or the five pages of the All for Transportation (AFT) tax hike charter amendment. AFT did not provide the voting public any specific projects that the 30-year massive 14 percent transit tax hike actually funds. Yet it has been reported in local media that this 30 year 14 percent massive transit tax hike is funding the Metropolitan Planning Organization’s 2040 Long Range Transportation Plan (LRTP). The Hillsborough MPO admits in their 2040 long-range transportation plan (LRTP) that the majority of respondents to their public outreach resided in the city of Tampa. Tampa has less than 1/3 the population of Hillsborough County; 6,000 respondents is less than 1/2 percent of the population of Hillsborough County. “Based on responses from the Imagine 2040 survey, most respondents agreed that the programs should be funded at medium to high levels, and that additional funds should be spent in KES areas with larger employment bases like Downtown Tampa and the USF area as the best way to improve Hillsborough County’s transportation system by 2040.” Is spending additional transportation funds (e.g. tax hikes) in the city of Tampa the best way to improve transportation in Hillsborough County? What about unincorporated Hillsborough, traffic-congested Brandon and rapidly growing South County? The word “charter” did not appear in the amendment text, title or summary. The word “rail” does not appear anywhere in AFT’s charter amendment. It is not in the text, title or summary of the transit tax hike ballot language. It is nowhere to be found. But…costly rail is all through the MPO’s 2040 LRTP. It is included in the MPO’s one-cent funding scenario. Interesting that we find the use of one-cent vs one percent to describe a transit tax hike in the MPO documentation and AFT’s ballot language. Is that coincidental? Previous proposed transit tax hike ballot language used percent terminology as that is how the transportation surtax is referred to in state statute. Beth Alden, Executive Director of the Hillsborough MPO, has told us the MPO will include rail again in their 2045 planning they recently began. The MPO must be planning on AFT’s transit tax hike passing in November so their 2045 LRTP will match it. When contacted, the Times stated they were told by someone from both the MPO and AFT, when the petition drive began in June, that AFT’s transit tax hike was funding the 2040 LRTP. When we subsequently asked the Times who at the MPO and AFT told them that, we did not get a response back. It is logical to assume it was Beth Alden from the MPO since she was quoted in the Times June article. If AFT’s transit tax hike is not funding the MPO’s 2040 long range transportation plan, then what transportation plan and projects is their 30 year 14% transit tax hike funding? So where is the clearly defined list of projects that will be funded by AFT’s 30 year 14% transit tax hike? Voters want to know this information BEFORE the election. This is especially important with this massive tax hike because the 5 pages of tax hike regulations prohibits and greatly restricts changes – even when there is failure or an economic downturn. Taxpayers are stuck for 30 long years. The Times should hold AFT’s charter amendment to the same level of accountability, clarity and honesty to ensure voters are not subject to any ballot language deceit. 2040 Long Range Transportation Plan, All for Tansportation, Beth Alden, Hillsborough County MPO, Tampa Bay Times.